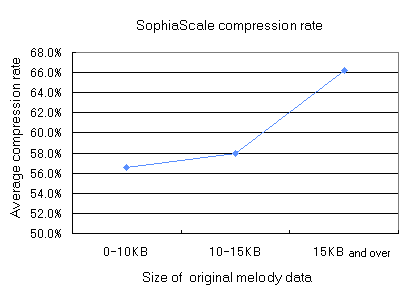 SophiaSCALE enables an average "ring tone melody" compression of 66%, and a maximum compression of 85%. Consider a ring tone melody of 20 kb, it will be reduced by approximately 13 kb. 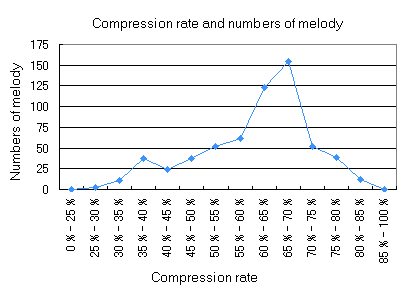 The following graph is drawn with compression ratio as a horizontal and the number of ring tone melodies as a vertical. The data was collected according to the results of compressing approximately 600 ring tone melodies with SophiaSCALE. The following graph is drawn with ring tone melody sizes as a horizontal and the corresponding compression ratios as a vertical. The longer the ring tone melody, the bigger the compression ratio.